The Pacific rat, or Polynesian rat, or kiore, was, on the face of it, an unlikely agent of destruction. It’s a small species, smaller than the ship or Norway rats (aka black and brown rats), from Asia. Under normal circumstances it would never have spread across the ocean, because in the wild it is a poor swimmer, unable to even cross water barriers of 200 m. But like the ship and Norway rats its commensal, living closely with people, and it was able to follow humans across from Asia through the Pacific, reaching most islands from Hawaii to New Zealand. In New Zealand, the timing of the rat’s arrival is a matter of some debate. It was long assumed that Pacific rat arrived with the Maori when they began settling the islands of New Zealand in the 13th century AD. But radiocarbon dating has suggested that the rat arrived much earlier than that. Over a thousand years earlier. While there is still some debate, it seems that the rat arrived from somewhere around the Cook Islands in Polynesia between 50 and 150 AD. This also means that the Polynesians had found the islands a great deal sooner than anyone expected (the Maori are Polynesian, by the way), but either chose not to settle or any settlements made then failed to establish. But the rats did establish, on both the main islands. New Zealand, as I have noted before, was until that point a mammal free zone. It is interesting to note that it hasn’t always been. One of the more interesting palaeontological discoveries of the last decade was of a mammalian femur and mandible in the Miocene (19-16 MA) deposits. The mammals was a mouse-sized non-flying mammal of uncertain relationships, it doesn’t seem to have been a marsupial, monotreme or placental mammal, but until more remains are found this won’t be known for certain. At any rate, the status of New Zealand as a mammal-free island is a more recent thing than previously thought. In fact, I could go on about the amazing discoveries there, but that is perhaps a post for another day. Sigh, so many subjects, so few posting opportunities. Anyway, before I get ridiculously sidetracked, New Zealand was no longer a mammal-free environment. No longer mostly mammal free (there are bats, and those bats actually run around on the ground acting kind of like shrews, and…. I’m getting sidetracked again!). The changes that this brought about have been difficult to pin down until recently. No one witnessed the changes, and for many years it was thought that Pacific rats were harmless herbivores, even to scientists who acknowledged the danger of ship and Norway rats (as the top quote demonstrates). But the Pacific rat was not harmless, and but an opportunist that found itself in a world where nothing was able to resist it. They were able to tackle birds as big as and even larger than themselves, and break into eggs up to 7 cm in length. The evidence was also visible in to the fossils and distribution records. New Zealand has an excellent fossil record of birds, and small birds, reptiles and even insects are particularly well represented in the middens of the extinct Laughing Owls. These middens were used by many generations of owls, and were used after the introduction of the rats as well. It wasn’t until larger, more dangerous predators were introduced that the Laughing Owl succumbed to extinction. But I digress. The point is that the middens provide a history of the changes in prey. When the rats arrive, the small birds, the reptiles, the bats and the large insects vanish from the record. 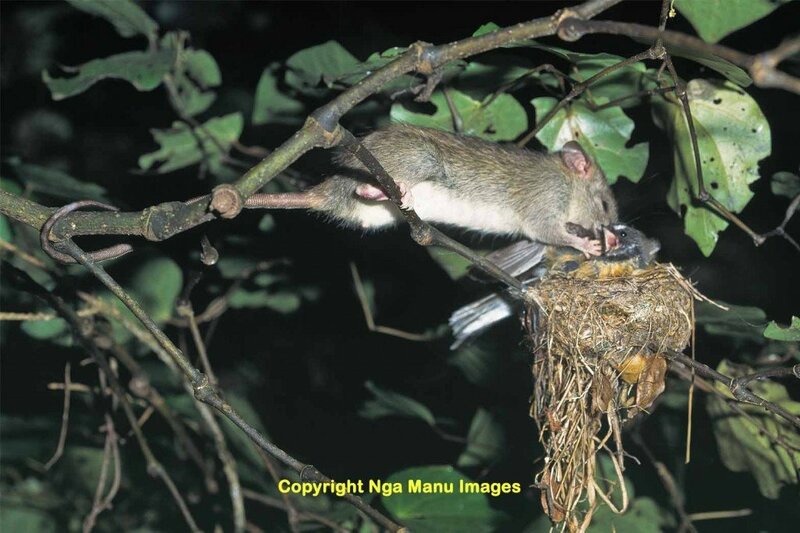 Echoing what happened in the past, a black rat (not Pacific rat) attacks a New Zealand Fantail on the nest. Even surviving species remain vulnerable to nest predators in New Zealand. Image copyright of Nga Manu Images, which allows image use for conservation advocacy and education purposes. Distribution also paints a picture. Take Duvaucel’s gecko. 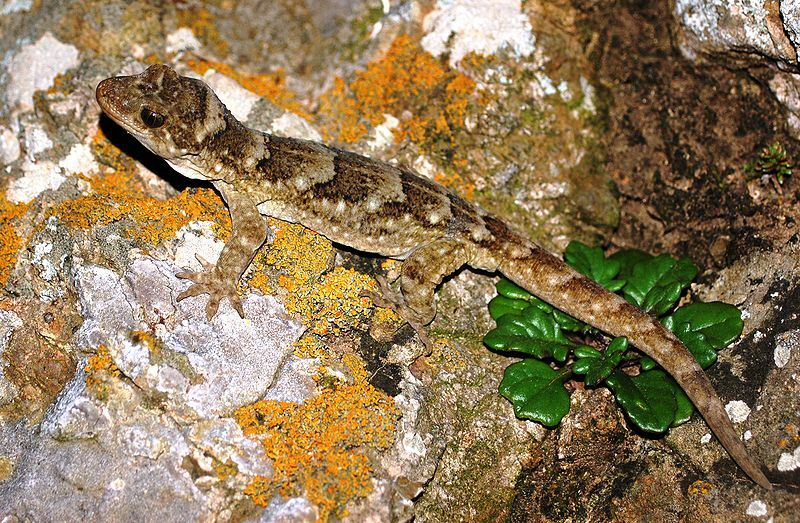 Named in error after a scientist that never saw it or had anything to do with it (another story for another time), it is the largest surviving species of gecko in New Zealand. Today the species has a rather disjunct distribution, existing on islands in the Cook Straight (the body of water between North and South Islands) and off the coast off Northland in the north of North Island (how many times can I fit the word north into one paragraph?). The disjunt distribution is an artifact, however, of range contraction. The fossil record shows the species once ranged across the mainland of New Zealand and was found as far south as Otago (central South Island). This disjunt distribution pattern is found in many of the smaller species of New Zealand (and some of the larger ones too). The so-called Stephen’s Island Wren was not endemic to Stephen’s Island, that was merely the only place the species survived when Europeans arrived. Duvaucel’s Gecko (Hoplodactylus duvaucelli), North Brother Island, New Zealand. Image by Jennifer Moore, released on a Creative Commons Attribution 3.0 Licence. The Steven’s Island Wren was one of three wrens to suffer badly at the hands of the Pacific rat. The Stout-legged Wren and Long-billed Wren didn’t even survive to the arrival of the Europeans. It is hardly a coincidence that these three species were the most flightless members of the family. Other small birds to be wiped out or at least restricted to offshore islands by the rats were the two snipe species found on mainland New Zealand, as well as the smaller rail species. In Allan Tennyson’s “Extinct Birds of New Zealand” it is stated that that the Pacific rat was certainly a contributor in 14 bird extinctions; in addition to the three wren species he lists the New Zealand Raven, Chatham Raven, Chatham Fernbird, New Zealand Owlet-nightjar, North and South Island Snipes, Forbes’ Snipe, Hodgen’s Waterhen, Snipe Rail, Finsch’s Duck and Scarlett’s Shearwater. They may have also contributed to the extinction of the nine further species, the Huia, Bush Wren, New Zealand Coot, Chatham Coot, Hutton’s Rail, Forbes’ Harrier, Auckland Island Merganser, Scarlett’s Duck and New Zealand Bittern. Of all the introduced species that decimated the wildlife of New Zealand, the Pacific rat was second only to us in terms of species exterminated (although the cats certainly gave them a run for their money). One final irony, in a technically incorrect but widespread usage of the term, is that the Pacific rat’s current status in New Zealand. Like many of the species it devastated the Pacific rat is today restricted to smaller offshore islands. It’s disjunct distribution is not the result of eradication attempts, but the fact that this small rat is unable to compete with the later introductions, the Norway and ship rats. It may well be that soon the story of this species will end in new Zealand. But it’s geologically brief visit will leave a deep impression on New Zealand long after it is lost. This series of posts has been among the best I’ve read on any natureblog Duncan. I thought I was rather well informed on the pacific island extinctions but each post has given me a couple of added little nuggets or sources of knowledge. Brilliant stuff and long may it continue (the postings not the extinctions obv._). I absolutely agree with TH (not for the first time!) – wonderful posts and extremely informative. Thanks Duncan. Is Newt an Ugly, Angry Bird?